Book News: Apple Settles In E-Book Price-Fixing Lawsuit : The Two-Way Also: Sherlock Holmes is now (mostly) in the public domain; Daniel Genis writes about celebrating Bloomsday in prison. 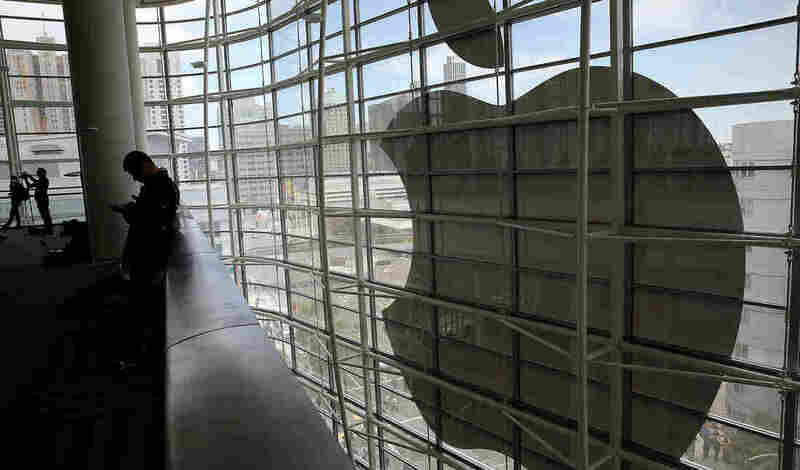 The Apple logo hangs outside San Francisco's Moscone Center earlier this month during the Apple Worldwide Developers Conference. Apple has agreed to settle with U.S. states and consumers in a class action brought against the company for conspiring with publishers to fix the prices of e-books. The trial was set for July, and the company could have faced $840 million in claims. Nearly a year ago, U.S. District Judge Denise Cote found Apple guilty of colluding to set prices. Cote also presided over the civil suit, and she asked the parties on Monday to submit a filing asking for approval of the settlement agreement within a month. Apple is appealing Cote's 2013 ruling. Although terms of the settlement were not disclosed, the court filing states that Apple will have to pay the settlement only if it does not win the appeal. South Carolina's Legislature is reacting to the teaching of gay-themed books at two public universities by requiring the schools to devote the same amount of resources to teaching the Constitution and other founding documents. Gov. Nikki Haley upheld the measure last week. The University of South Carolina-Upstate had assigned Out Loud: The Best of Rainbow Radio, edited by Candace Chellew-Hodge and Ed Madden, a collection of writings about being gay in the South. The College of Charleston had assigned Fun Home, Alison Bechdel's bestselling graphic memoir about growing up and coming out. Some lawmakers initially wanted to strip the schools of funding for the books, but reached a compromise in which an equal amount of money had to be spent on texts related to "the study of and devotion to American institutions and ideals." Ten academic and free speech groups including the Modern Language Association and the American Civil Liberties Union of South Carolina condemned the measure as "a destructive assault on academic freedom." In a letter, the groups added that the measure is not only "educationally unsound," but also unconstitutional, writing, "The Supreme Court has sent a clear message over decades: lawmakers may not prohibit the expression of ideas simply because they find them to be offensive." "After I'd been convicted, my father had said, 'Good. You'll finally read Joyce.' " For The Paris Review Daily, Daniel Genis writes about celebrating Bloomsday in prison. Sherlock Holmes is now (mostly) in the public domain, and writers of works based on the detective stories no longer have to pay licensing fees to Arthur Conan Doyle's estate. An appeals court ruled Monday that stories Doyle wrote before 1923 are in the public domain, but the 10 stories published afterward are off limits. For example, it is only in the later stories, the court noted, that "Holmes's attitude toward dogs has changed — he has grown to like them — and that Watson has been married twice." For The Millions, Jonathan Russell Clark writes about epigraphs: "You see, I love epigraphs. Everything about them. I love the white space surrounding the words. I love the centered text, the dash of the attribution. I love the promise."